If you are looking for a hotel that has it all then look no further! After 30 years of traveling around the world, (a lot of it in Morocco) my experience at Auberge du Sud now stands out as one of the best. Overall, the hotel displays a strong sense of style and good taste. The rooms are very comfortable and beautifully appointed. The en suite bathrooms are kept perfectly clean and the water runs strong. The swimming pool is wonderful with its view to the sand dunes of Erg Chebbi. And the price is way below what one might expect to pay for such luxury. If adventure into the golden sand dunes of Erg Chebbi is your thing, the guys at Auberge du Sud will tailor a trip to your exact needs. We took a two day, two night camel trek into the desert. On the first night we stayed at the Desert Nomad Bivouc dancing to the sounds of Berber drums under a blanket of stars. On our second night, we stopped at Auberge du Sud's luxury camp site with its large tents, soft beds and hot showers. 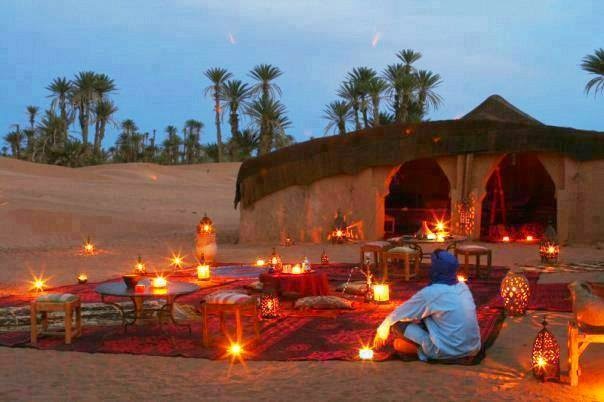 Very nice after two days riding camel. We will be going back and plan to stay much longer next time!